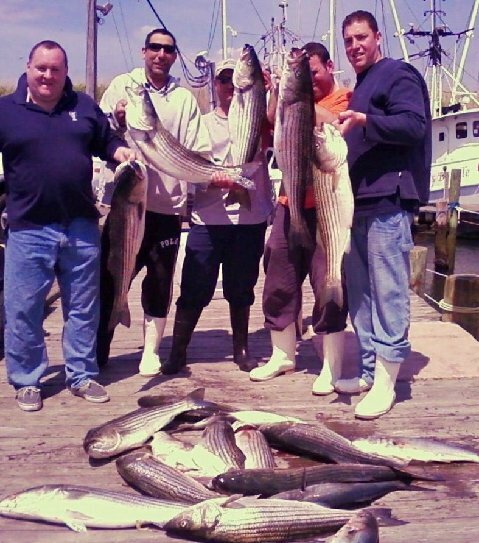 Striped bass fishing along the New Jersey Coast is at its best in the Spring and Fall, but they can be caught all summer long. Striped bass migrate into and out of rivers, and bays, and also up and down the coast. Generally, they take up residence in the same places, and at the same time every year. 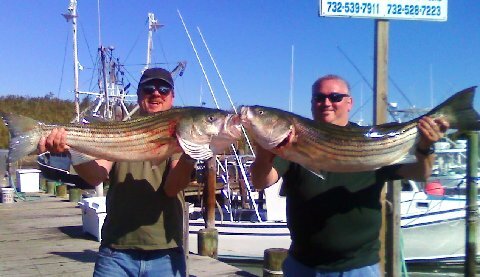 Striped Bass Charter Fishing in Point Pleasant, New Jersey is very popular, mostly because they are fished close to shore, they fight hard, and they taste good. Striped Bass Fishing Season is April, May June/ September, October & November! Most of the striped bass we catch are between 10 to 30 pounds with an occasional 30 to 40 pounder. 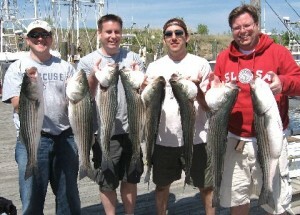 The Blue Chip has a special permit, that lets our customers keep extra striped bass over the state quota. Based on conditions that prevail, such as water temp and water clarity, we decide which method of fishing will be more productive. They can be caught by live lining bunker (live bait), trolling, or fished at anchor using clams or cut bunker. 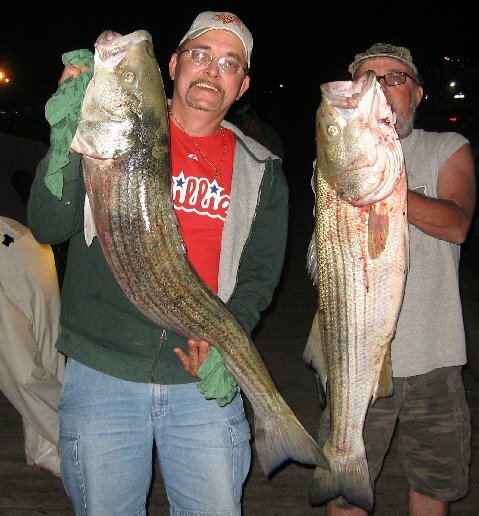 Some years, striped bass fishing is better than others. But when the season gets underway, the Blue Chip crew will put you into some great charter boat fishing for stripers! As usual, Wayne, our first mate will bleed, clean, ice down, and bag your catch.